[…] [Arnold B.] Chace said this will be the first time that he has built a new building from scratch downtown. His past projects involved the revitalization of historic buildings. And therein lies a challenge: creating “a modern building that’s harmonious with the downtown historic fabric,” Chace said. Full disclusure: I work for the developer, Cornish Associates. This is fantastic news for downtown Providence because it addresses three key needs. First, there is no full service, downtown grocery store today, and the idea that people have to get into a car whenever they need to pick up a quart of milk simply doesn’t meet the definition of urban living. Second, it addresses the desperate need for more downtown residents. In 2010, there were less than 2,500 year-round (i.e., non-student) residents living downtown. Greater density is needed to support the types of amenities that people expect in an urban setting. And third, it eliminates a parking lot and curb cut on Washington Street, which from Dorrance to Empire has the potential to be an important pedestrian corridor. But along this corridor, the city should also limit ground level parking and curb cuts in favor of shops; plant some trees, improve lighting, etc., which would result in more retail sales, higher property values, and a more dense, diverse and walkable environment. Bravo! This is reminiscent of Rhode Islander’s that say only old or poor people live in high-rise buildings, meaning that “normal” people only live in single-family houses or wood frame buildings that are three floors or less, or worse only “normal” people drive and only poor people ride the bus. Last I noticed “students” that live downtown were people that live downtown. Like others they pay rent, buy things, and go out for entertainment. Many register to vote as they are entitled to. I could be wrong, but I thought that when the US Census surveys a neighborhood, students that live within that neighborhood are counted as part of that population. Many students live downtown for nine months of the year, while others stay for twelve. There are plenty of “full-time” Providence residents that vanish from the city for three months to go to beach houses in Little Compton or Narragansett. It doesn’t matter that students may have their rents paid by someone else. There are plenty of 30-somethings that live in Williamburg and Bushwick full-time, whose rents are paid by a trust fund, yet they are residents of Brooklyn. What does the US Census say the population of Downtown Providence is? First, it addresses the lack of a full service downtown grocery store today. Second, it addresses the desperate need for more downtown residents…of any type. Greater density is needed to support the types of amenities that people expect in an urban setting. And third, it eliminates a parking lot and curb cut on Washington Street. But, I am disappointed that it is not taller. Again, the city should be actively encouraging and in some cases requiring much taller structures. I would hope this is revised to a smaller footprint and taller structure…8-12 floors. I think this is great. 6 stories is fine. Some of the best cities in the world are low rise and some of the most beautiful structures in RI are 6 stories or less. What is this company’s track record as far as design and quality of new structures? Since we don’t have an example here in pvd. Any clue why they are looking for an independent grocery and not Trader Joe’s or even that newer concept Whole Foods? This is great. Agree on the point that this building may not be tall enough — and by tall enough, I mean that there is probably demand for more units in this location. As many know, there is a chronic shortage of downtown apartments — If this ends up being 40 apartments… why not double that number? Surely, the demand is there. Agree completely with the point that students are in fact, residents. Their money is green. Downtown population is rising, and hopefully more office conversions into residential units will continue that trend. Once that inventory is converted and the office vacancy rate decreases, they health of the City on many fronts will improve. This helps strengthen Washington and Fountain, but also Westminster since it will increase foot traffic and the viability of retail on that corridor. To answer your question, the US Census does count students, and in 2010, the downtown population was 4,569: 2,148 students and 2,421 non-students. My point in distinguishing between the two is not to demean students or to suggest that they don’t contribute to the local economy, but rather to acknowledge that the majority of students leave the city for roughly three months in the summer, and downtown businesses can’t close for 25% of the year just because the downtown population drops by nearly 50%. Students do enliven downtown, but Providence needs more year-round residents to support year-round businesses. I also agree with the argument for greater density, but Providence can only achieve this with better public transit. (Here, students are clearly more desirable since the majority of them don’t own cars.) There is still a mindset (and most zoning) that every apartment with one bedroom or less needs at least one parking space, and every two-bedroom needs two: that’s about 25% of both the space and the cost that is allocated to parking, or at least one floor of parking for every 3 floors for apartments. At one parking space for every two or three workers, the ratio for commercial space is even higher. Providence can only get these ratios down with better transit. And yes, if transit works, even “normal” people will use it! I’d love to have better public transit, but I don’t see it as an absolute necessary right now. Plenty of apartments can be built close to the train station (Capital Properties has many lots that would be great for high-rise apartment buildings) without any more investment into rail… although that would be terrible. I’m hopeful that a RI-Rail system becomes a reality, but the ridership can be fostered until the dollars are available. I’d like to see *more* tax stabilization plans for developers in Providence. Cap every tax break at 10 years and open the flood gates. If developers built 1,000 apartments downtown, they’d all be full. There is a chronic shortage of apartments downtown, just talk to people who live down here and they will tell you — it is under reported. If there were 2,500 full-time residents living downtown in 2010, it has to be double that now. It is a start, but I wouldn’t say its creating sustainable urban living. The City (and State) needs to do whatever they can to support developers who are working on projects that will increase the downtown population. In reality, it is not asking much. They have the Superman proposal in front of them right now and that’s 275 apartments, and Fane’s proposal would be 1,000 units if all three towers were built in the Jewelry District. They just have to commit to getting the deals done and holding the developers accountable for starting the projects on schedule. The reason for a six story building is likely due to construction costs. You can (by code) build up to five stories in wood on top of a concrete/steel podium (the retail level). Building the upper floors in wood greatly reduces overall construction costs. I would second the comment that six-stories is a great height for urban fabric. Look around downtown providence, and other cities in the region, you will see a range of building heights from 3-6 stories and it creates great outdoor rooms. 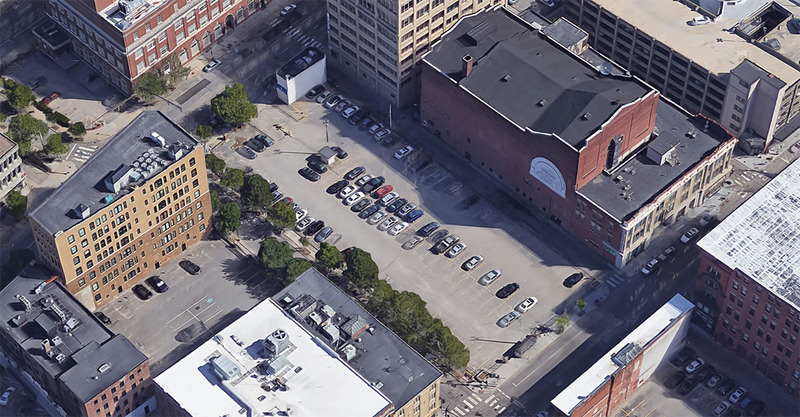 I hope that you are correct that there is more demand than can be accommodated in this mid-rise building, and that that demand spills out onto adjacent parcels… There’s plenty of under utilized land/buildings in downtown Providence. All the more reason for Providence to invite Uber / Lyft / Ford or any other big player to get driverless service technologies up and going here! Imagine working on Dorrance, grabbing a ride to the market to grab a few things, and then back to the garage near the square to get your car and head home. Or imagine what else it could do for restaurants that are otherwise hard to get to. We don’t need more garages though, we need the next wave of technology to cap garage limits, and start to roll them back by simply making them redundant.